Britain's four-time champion Jump trainer has yet to win the four and a quarter-mile contest, having filled the runner-up position with Zongalero (1979) and The Tsarevich (1987). Henderson has three entries in this year's renewal headed by Gold Present (11st), a 20/1 chance with Betway , official betting partner of the Randox Health Grand National Festival. The eight-year-old has landed competitive handicaps at Newbury and Ascot this season and was chased home in fourth by stable companion and fellow Randox Health Grand National entry O O Seven (10st 11lb, 66/1 with Betway) over three miles at Ascot on December 23. Gold Present was travelling well when falling at the 11th fence in the 2017 Randox Health Topham Chase over the Grand National fences. Henderson's trio is completed by Vyta Du Roc (10st 6lb, 33/1), an impressive 22-length winner at Cheltenham on New Year's Day. The nine-year-old Lion Noir gelding has been off the track since, after a bout of colic. Henderson said: "Both Gold Present and O O Seven are in good form at home and I think the plan is probably to head to the Randox Health Grand National, but they both could do with running again beforehand. 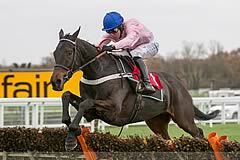 "Gold Present has come out of his latest run well and is entered at Ascot on Saturday (declared for the Listed Swinley Limited Handicap Chase, 2.25pm) so I think he will probably just head there and see how he gets on before making any firm decisions about Aintree. "He was running well in the Topham last year before falling so we could go back to Liverpool with him. If he is going to go for the Grand National, then I would definitely be leaving Cheltenham (in March) alone. "O O Seven could go to Kempton next weekend or he could head to the Cheltenham Festival before potentially going for the Grand National. He ran in the Topham last year and was fourth, which is definitely a good prep for it. "Vyta Du Roc has had a bit of colic and we'll just see how he is before making any decisions." Dan Skelton is another trainer with three entries looking for a first victory in the world's greatest and richest chase. His team includes Virgilio (10st 4lb, 100/1), who has won on three of his six starts around the Mildmay Course at Aintree. The nine-year-old was pulled up on his most recent outing at Doncaster on December 16, but signed off last season with an impressive seven-length victory at Aintree under top-weight in a handicap chase over three miles and one furlong in May. Skelton commented: "Virgilio has come out of his latest run really well. I need to speak with the owners to see where the land lies as to whether they fancy heading for the Grand National. "We will definitely give him a run beforehand and there's the possibility of going to Newbury for the Greatwood Gold Cup on March 3 which is probably short of his distance, but it should help to give us an idea as to where we go. "He has an excellent record at Aintree and he really seems to enjoy running there. However, the Grand National isn't set in stone and we'll have to play it by ear with him. "Virgilio is not the biggest horse in the world so the Grand National has not been a long-term plan that we've really thought about, but he is a horse who loves to run for you. "He wears his heart on his sleeve and, when I worked for Paul Nicholls, Neptune Collonges wasn't a big horse, but he won the Grand National in 2012 so that doesn't put us off him. "It's the Grand National and anything is possible." Skelton also has Long House Hall (10st 5lb, 80/1), a winner at Market Rasen in July and a creditable fourth behind Wakanda over three miles in the Listed Sky Bet Chase at Doncaster on January 20, and Sir Mangan (9st 11lb, 100/1), who is set to run in the G3 Betfred Grand National Trial at Haydock Park tomorrow, Saturday, February 17. The market for this year's Randox Health Grand National is headed by the 2017 fourth Blaklion (Nigel Twiston-Davies, 11st 6lb, 10/1) following his 12-length victory in the Randox Health Becher Handicap Chase over the Grand National fences at Aintree in December. He also runs in the Betfred Grand National Trial at Haydock Park tomorrow. The Randox Health Grand National weights are headed by the Brian Ellison-trained Definitly Red (11st 10lb, 20/1), an impressive winner of the G2 BetBright Cotswold Chase at Cheltenham last month. Definitly Red was one of the leading contenders for 2017 Randox Health Grand National, but was pulled up on the first circuit with a tack problem. The world's greatest and richest chase is the highlight of Aintree's three-day Randox Health Grand National Festival and takes places with a maximum of 40 runners at 5.15pm on Saturday, April 14.